Please give a summary as to the Fund’s risk mitigation procedures. and Tax Due diligences, with final Reports about possible risks for each transaction. What is the outlook for investments in the market(s) that the Fund concentrates on? Please describe the fee structure for the Fund. Why BR-NAS German Mittelstand Properties Capital Management and its Fund? What is the competitive advantage of the Fund? • Subscription via ISIN, investment held by your Bank. What is the investment focus of the Fund? niche of EUR 10 – 20 million, typically sold by private individuals with limited real estate expertise. increase and value appreciation potential by applying professional real estate asset management. Is the Fund permitted to borrow? Please explain BR-NAS German Mittelstand Properties’ track record in the real estate markets in general and the German market in particular, giving details of specific investments. We have acquired an asset in a business center in Dortmund in 12/2016. To date a value uplift of 7.4% has been realized. This is exemplary for the current market conditions in Germany. It underlines that growing demand for real estate in A-Markets meets low supply letting B-Markets such as Dortmund profit. During the purchase process, we were able to let space to a new tenant almost achieving full occupancy, which is representative for current rental space situation in Germany. Due to a semi-off-market deal we were able to get our hands on a property that will benefit the fund, illustrate best practices, and points out the importance of our network. Based on this expertise, BR-NAS follows a holistic and creative approach to creating sustainable value in real estate across market cycles and environments. We focus on creating value across the entire value chain – sourcing, acquiring, developing/managing successfully exiting investments. What is the investment philosophy and strategy of the BR-NAS German Mittelstand Properties Fund? Responsibility: Long-Term thinking is an integral part of BR-NAS and our strategic approach to acquiring and managing real estate. Transparency: Open communication is the essential element for working with our stakeholders. Integrity: Excellence in real estate demands responsibility. A holistic and consistent approach to our values is of utmost importance to us. What is the target return of the Fund? • 5% Distribution Yield p.a. What is the intended investor base for this Fund? What are the minimum investment amounts, ie., institutional vs. retail/UHNW/HNW? Is there a lock-up period for the Fund? The BR-NAS fund is a closed-end investment fund. The investment term is 7 years +1 +1. What is the accounting standard for the Fund? What is the base currency of the Fund? Euro. USD share classes are available. What is the legal structure/domicile of the Fund? What is the Fund’s cash management policy? re-opened before every acquisition. This ensures that there is no surplus cash not invested. summarize the Fund’s investment process. Please give potential investors an idea as to the geographic make-up of the investors in the current Fund plus percentage of those re-upping for this current Fund. Also please characterize what types of investors have traditionally invested in Blue Rock and/or BR-NAS, i.e. banks, insurance companies, pensions, SWFs, FOs, corporate, etc. Please give an example of an investment that has been beneficial and value-added to the overall portfolio and conversely an example of an investment that has not panned out according to expectations. Also explain lessons learned from the latter case. There are no properties that had a bad impact on the fund. Why a real estate investment in Germany as opposed to the UK? Is the investment argument focused solely upon the dynamics of Brexit or a combination of other factors? volatile markets and a strong EU Economy. Why is the BR-NAS structure suitable for potential investors? What are its advantages and disadvantages? Why the focus on multi-tenant offices and professional health spaces? attached to the locality, pay higher rents, and have a good to moderate credit standing. Is the Fund suitable for the Family Office portfolio? The fund is very suitable for a family office approach, as bankable via ISIN, AIFMD regulated vehicle, with Bi-Annual distribution and quarterly NAV and reporting. An investment into BR-NAS prevents an outflow into traditional real estate. A strong client binding due to a tangible asset class is created. If this current Fund has had a first close already, please explain the types of investors in that first close. Also, please explain if the Fund has already made commitments/deployed capital from this first close in properties. Please describe BR-NAS German Mittelstand Properties’ local presence in the markets it invests in. in Berlin, Frankfurt and Switzerland. 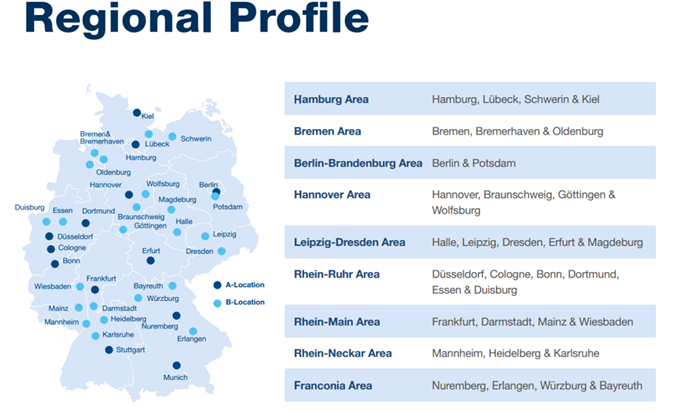 How is BR-NAS German Mittelstand Properties’ strategy distinguished from the other funds investing in these markets? network of our Management partners. beneficial for communication between Property-, Asset-, Portfolio- and Investment management. By actively managing our funds’ assets in house, we create best value and high security results. professionally enhancing the property and its underlying cashflows. What is BR-NAS German Mittelstand Properties experience in the markets it has traditionally invested in and how will it uniquely benefit investors? excess of EUR 4,5 bn across Germany and Central Europe. Who is the Investment Manager of the Fund? BR-NAS is the Joint venture between NAS Invest and the BlueRock Group. Multi-tenant office buildings and health centers (German: Büro- & Ärztehäuser) in a transaction niche of EUR 10 – 20 million, typically sold by private individuals with limited real estate expertise. These properties are usually well-maintained and fully operational, however, are undermanaged due to lack of professional letting and capital expenditure approaches. They therefore provide rent increase and value appreciation potential by applying professional real estate asset management. What are the exit routes that the Fund will look at for these acquired properties? The Fund aims at selling the diversified portfolio to an institutional investor as a whole (by way of selling the holding company). What are the principal risks and problems that you feel will likely be faced by this fund? The Fund aims at diversification which will be achieved by a) multi-tenant structures within the buildings, b) investments across various markets in Germany, c) various tenant backgrounds (industries they operate in). b) and c) are achieved at full investment and as such diversification only comes to full effect if the target fund size is reached. What portions of total return are likely to come from rents and from capital gains? Typically 65-75% from rental income, the remainder from capital gain. How were the returns from the above investments? On average, the performance lies at around 10% IRRs. The track record on slide 17 and 18, is that the track record of the individual team members? This is the track record of both our team members and BR-NAS. Is there a hard cap for a single investment? At full investment no single property shall represent more than 30% of the Fund. What is the average investment size and how many acquisitions would be done from the Fund? Typical deal sizes are €10-25m so we estimate the total to be about 20 buildings split across 7-9 German metro areas. Is there any oversight or regulation on the investments? Bluerock and NAS together manage more than EUR 850 million of real estate assets and thus are subject to the European Union‘s Alternative Investment Fund Management Directive (AIFMD). Such AIFMD-oversight is provided by Maitland (MS Management Services SA), a globally operating company established in 1976 and registered with the Commission de Surveillance du Secteur Financier – the Luxembourg financial authority. Is it possible to also invest building by building, i.e. in co-investments? Yes, co-investment opportunities are offered to existing shareholders on a priority basis. However, selected investors are being invited to co-invest along the joint venture from time to time. Who takes care of the Funds and investment vehicles which carry the assets? Within the joint venture, Bluerock deals with all fund-related matters including the implementation of tax-efficient investment structures, the flow of funds and distributions to investors. Who takes care of the investments and lifts the properties‘ upside potential? Within the joint venture, the NAS INVEST Group takes care of all property-related matters including the sourcing, acquisition, management and successful divestment of the buildings. This is conducted via the firm‘s German branches in Berlin and Frankfurt, which enable it to efficiently and effectively manage properties across the country. For further information please visit www.nas-invest.com. Where are the properties typically located? Multi-tenant office buildings and health centers (German: Büro- & Ärztehäuser) in a transaction niche of EUR 10 – 20 million, typically sold by private individuals with limited real estate expertise. These properties are usually well-maintained and fully operational, however, lack a professional letting and capital expenditure approach. They therefore provide rent increase and value appreciation potential by applying professional real estate asset management. German commercial real estate rents stand at mid 1990s levels. Due to low construction activity over the past 20 years, the resulting demand overhangs rents, causing prices to increase. The positive economic and demographic fundamentals underpin this development.